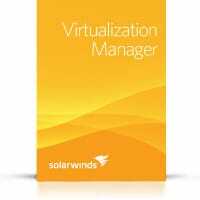 SolarWinds Virtualization Manager - Symtrex Inc.
SolarWinds Virtualization Manager takes you from the early stages of virtualization deployment and all the way to implementation of private cloud initiatives and IT-as-a-Service. Our unified approach to VMware® capacity planning, VM sprawl control, performance monitoring, configuration management, and chargeback automation makes it easy to take control of your virtualized environment – regardless of whether you manage as few as fifty virtual machines or a corporate cloud the size of a small planet. Today there’s only one way to really simplify management of IT environments – with software designed from the ground up to manage the complex and dynamically changing relationships that exist in your virtual infrastructure. At SolarWinds, we’ve improved the way that IT professionals around the world manage their networks, applications, servers, and storage environments. And now we are doing it again with SolarWinds Virtualization Manager, our comprehensive virtualization management software that delivers integrated capacity planning, VM sprawl control, performance monitoring, configuration management, and chargeback automation – all in one awesomely affordable product that’s easy to download, deploy, and use. In fact it’s so easy that you can be up and running in less than an hour!